Drone operators needed a tool that would let them understand the complexities of restricted airspace for unmanned aircraft operations. AirMap, a free, comprehensive digital map that allows unmanned aircraft system (UAS) operators to visualize the airspace around them, including areas where they may not be permitted to fly, has recently been made available to the public. AirMap gives users an easy to use, digital map that provides low altitude airspace information unmanned aircraft operators need in order to fly safely and avoid restricted airspace. The new platform was conceived by Ben Marcus, co-founder of leading aircraft brokerage firm jetAVIVA, and Gregory McNeal, associate professor of law and public policy at Pepperdine University Forbes contributor, and leading expert on UAV law. It integrates multiple sources data and gives UAS operators an easy-to-use, yet detailed, solution providing a single view of the restricted areas around an operation. The beta-version of the site is now live in the U.S. and launching internationally soon, enabling UAS operators to immediately start benefiting from the free service. AirMap also features a feedback function that will allow beta testers to request additional features. The genius of AirMap is that it’s a fully digital map that shows only the airspace rules that influence UAS operators. By focusing on airspace information from ground level up to 500 feet, AirMap strips away the clutter of higher altitude airspace labels found on charts that were created for manned aviation. 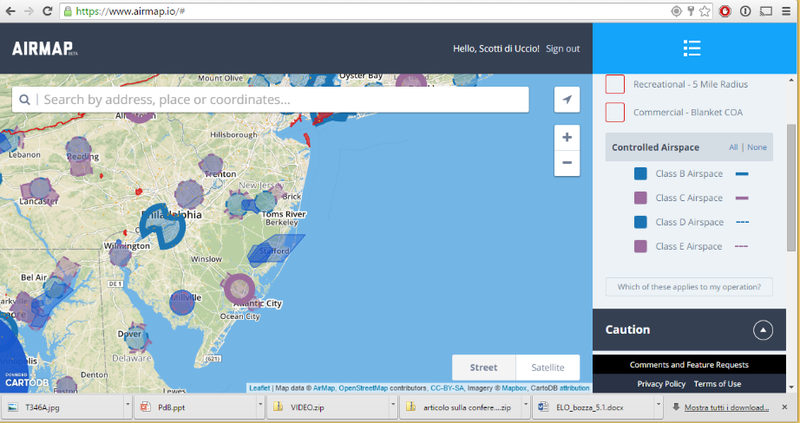 AirMap will become a necessary tool for UAS flights because it was created by UAS operators, for UAS operators. Using AirMap, operators can select layers depicting recreational use (which displays airspace around airports), blanket certificates of authorization rules applicable to holders of U.S. Federal Aviation Administration Section 333 exemptions, and controlled airspace, which complies with the FAA’s recent Notice of Proposed Rulemaking. Controlled airspace (Class B, C, D, and E) at 500 feet and below, allowing UAS operators to comply with the airspace rules proposed in the FAA’s recent Notice of Proposed Rulemaking on the Operation and Certification of Small Unmanned Aircraft Systems. “As UAS use continues to expand, the airspace in which operators are flying is also growing more complex. With this in mind, we’ve launched AirMap, which will serve as a resource for drone operators to immediately fly safely and in compliance with legal requirements. We want to make safe flying easy,” said Marcus. In February 2015, AirMap launched its first service, NoFlyZone.org, which accepts registrations from property owners who prefer UAS not overfly their land. These parcels are displayed in AirMap to help operators avoid sensitive areas, and minimize the hassles associated with disputes about where unmanned aircraft should be operating. AirMap also displays hospitals, schools, and helipads and will be adding other sensitive sites in the future. To test and comment on AirMap please visit: http://www.airmap.io/. Marcus, who co-founded leading aircraft brokerage firm jetAVIVA, will lead development and business growth functions. McNeal will apply his expertise and research in local regulatory environments to help AirMap reach and educate users throughout the country. In addition to his role with AirMap, McNeal is an Associate Professor of Law and Public Policy at Pepperdine University, a Forbes contributor, and a nationally renowned scholar who has been published widely. AirMap’s advisory board includes Dr. Steve Crocker, Internet pioneer and chairman of the Internet Corporation for Assigned Names and Numbers (ICANN), Stuart Banner, UCLA law professor and author of “Who Owns the Sky,” Tom McInerney, serial entrepreneur and former scientist at Apple, and Mike Mothner, founder and CEO of WPromote.